I'm a big fan of Bliss (whose founder, Marcia Kilgore is one of my beauty heroines) so I was excited to try out their new lip balm, Fabulips Softening Lip Balm. Lip balm is one of my most used beauty products- I always have some with me and am firmly of the opinion that a girl can never have too many, something which most likely comes from my teenage years when my friends and I would collect various flavours then sit in class and reapply them constantly. 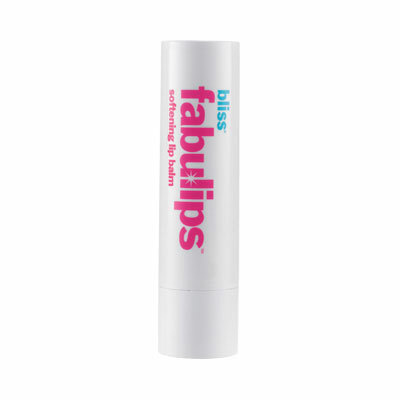 Fabulips Softening Lip Balm is the same lip balm which is used in every Bliss Spa facial treatment. On the packaging front, it gets the thumbs up from me for being presented in a practical stick format for easy, mess-free and hygenic on-the-go application. The formula contains shea butter, jojoba and grapeseed oils along with Vitamin E and it does feel as though it is melting onto your lips when you apply it. It feels soothing to apply and doesn't leave a sticky residue, just a glossy finish. I loved the sweet orange scent. I found that I needed to reapply regularly in order to maintain the moisturised feeling. Admittedly £12 is more than your average lip balm costs and I did find that I was getting through the tube at an even more alarming rate than usual so I'd question how long it is likely to last and this might put me off repurchasing. It's not the best lip balm I've ever used but I have enjoyed using it. Have you tried the Fabulips pack with the scrub and lip wash? Thanks for your comment. I have indeed- would you like me to review it on here?